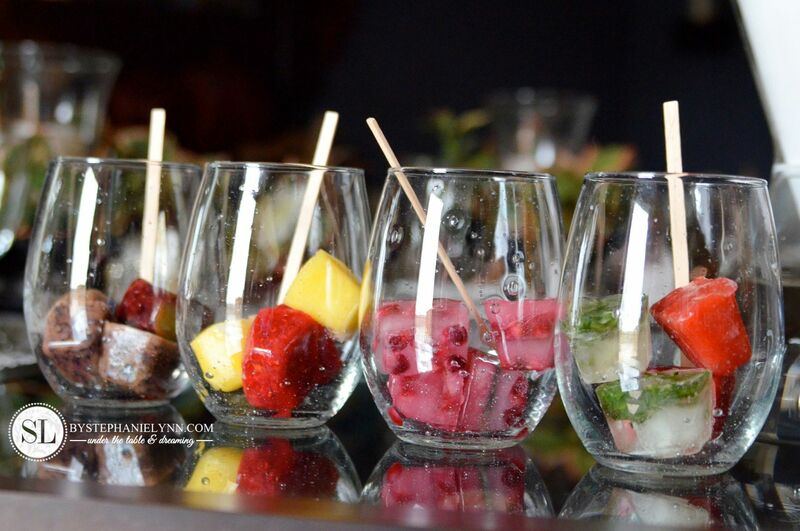 Flavored Ice Cubes – Infused Water Recipes with Soma | This post is part of a social shopper marketing insight campaign with Pollinate Media Group™ and Soma, but all my opinions are my own. #pmedia #givesoma http://cmp.ly/3/8vNxcO. I love opening our home and entertaining friends and family this time of year. 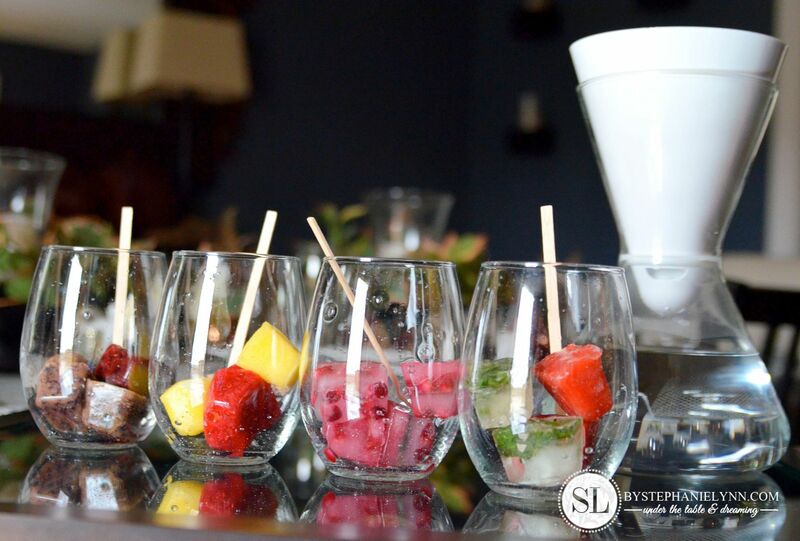 Along with all of the expected holiday beverages, this season I’ll be adding an flavored water bar to our party drink list. To save costs and waste on bottled water, we recently switched over to this sleek glass carafe from Soma. The handcrafted hourglass carafe is not only a stylish way to serve water but it also streamlines the water filtering process with it’s ‘all-in-one’ design. The carafe houses an all-natural filter made from Malaysian coconut shell carbon and layers of fine silk – which we love because it is not only organic but eliminates all of those floating black specks we have seen with other filters. The plant-based casing is also 100% biodegradable and BPA free – and every Soma filter you purchase supports charity: water’s efforts to end the global water crisis. 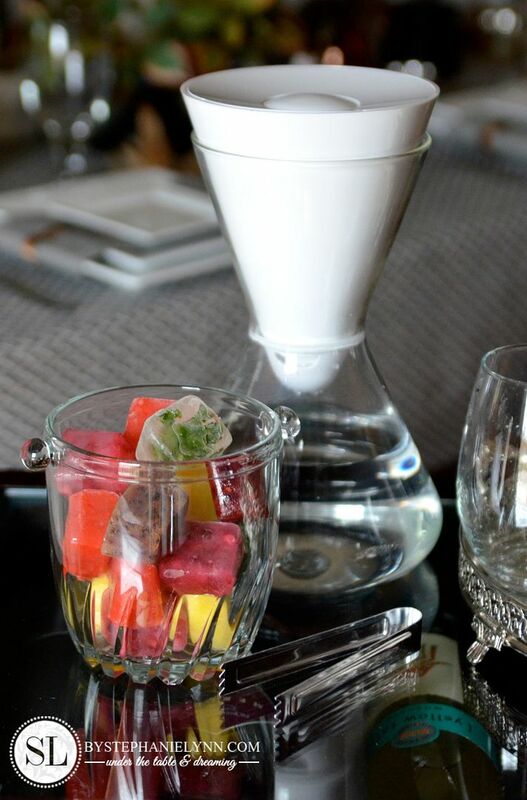 I like the idea of letting guests come up with own flavor combinations and by offering an array of flavored ice cubes, you can do just that. 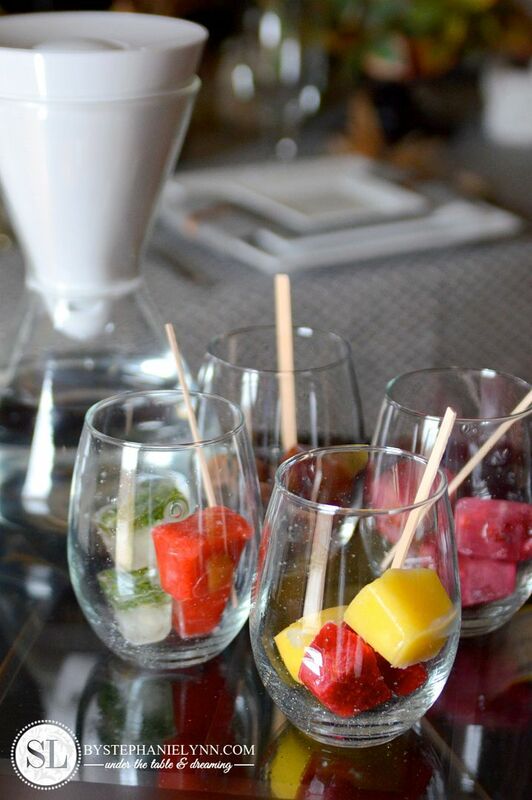 Flavored ice cubes can be made ahead of time and make a great presentation when added to filtered water – plus the flavor possibilities are endless. Puree fresh or frozen strawberries and mix in a small amount of filtered water. The consistency should be thick but pourable. Fill ice cubes trays with the puree and place in the freezer until frozen. For the basil flavored ice cubes – fill the ice cubes trays half way with filtered water and place in the freezer for 20-30 minutes. 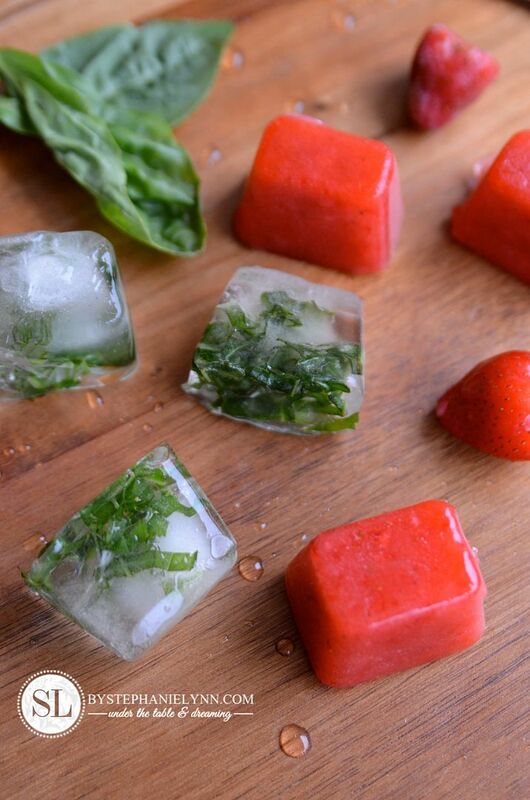 Remove and top the partially frozen cubes with fresh chopped basil, then fill with additional filtered water as needed. Place back in the freezer until frozen. Take a couple tablespoons of pomegranate seeds and place them in a small amount of filtered water. Using the edge of a knife crush the seeds to release the flavorful juices. 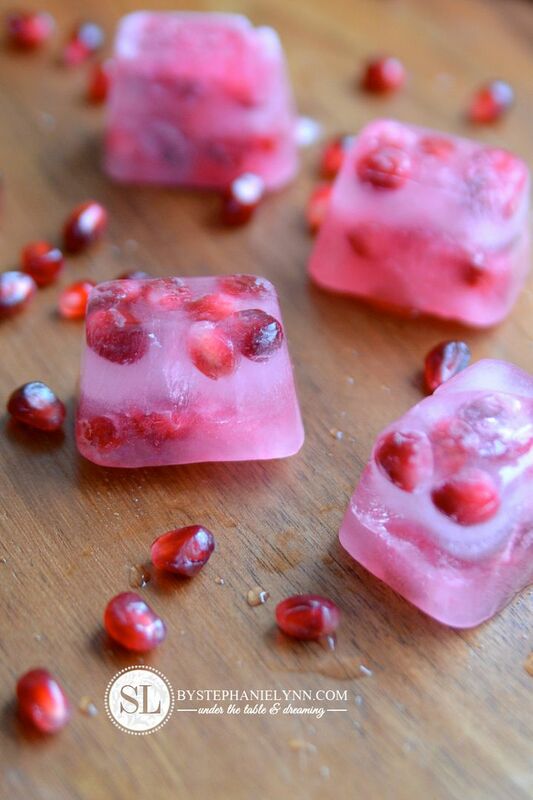 Pour the mixture into the ice cube trays, toss a few additional pomegranate seeds in each cavity, and place in the freezer until frozen. Puree fresh or frozen pineapple chunks and mix in a small amount of filtered water. The consistency should be thick but pourable. Fill ice cubes trays with the puree and place in the freezer until frozen. For the raspberry cubes, follow the same directions as above. Puree fresh or frozen blueberries and mix in a small amount of filtered water. The consistency should be thick but pourable. 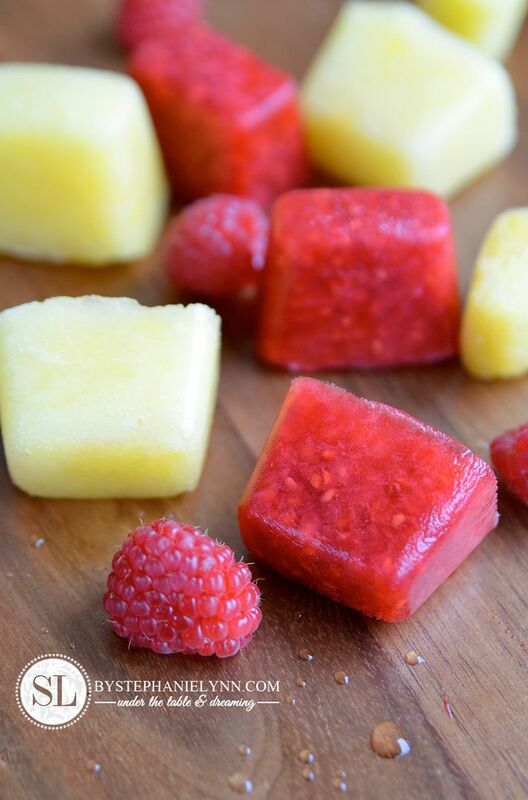 Fill ice cubes trays with the puree and place in the freezer until frozen. 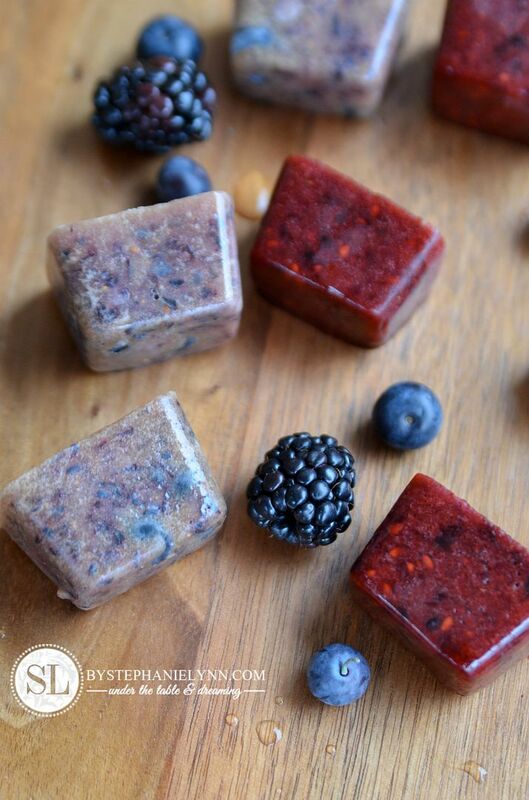 For the blackberry cubes, follow the same directions as above. Freshly squeeze 2-4 lemons. Combine the lemon juice with a small amount of filtered water. Fill ice cube trays with the juice mixture, sprinkle with dried lemon peel granules , and place in the freezer until frozen. 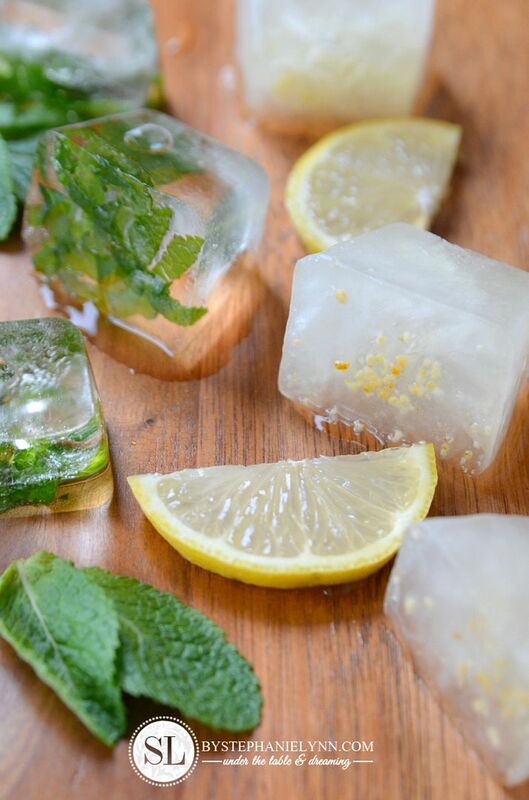 For the mint flavored ice cubes – fill the ice cubes trays half way with filtered water and place in the freezer for 20-30 minutes. Remove and top the partially frozen cubes with fresh chopped mint leaves, then fill with additional filtered water as needed. Place back in the freezer until frozen. 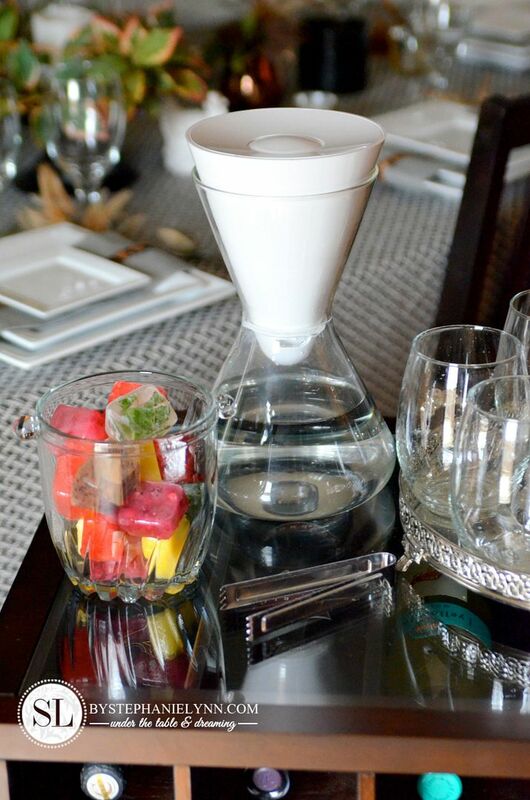 Soma & Homemade flavored ice cubes are two perfect reasons to say good bye to soda, artificial juice and bottled water during your planned get-togethers this season. You just can’t beat the presentation and the kids love combining the cubes just as much as the adults do. we don’t mind bringing to the table when entertaining our guests. Each Soma water filter is designed to process 40 gallons of water so we really do benefit from each $12.99 replacement filter – which lasts on average, about 2 months. There is no need to remember new filters either, as Soma’s fresh filter program automatically delivers a new filter to your door every other month (free shipping, too!). here’s a $10 credit on your first purchase. Learn more about Soma by visiting them on Twitter or stopping by their Facebook page. What a great way to add a fun and unique taste! Looks very refreshing.